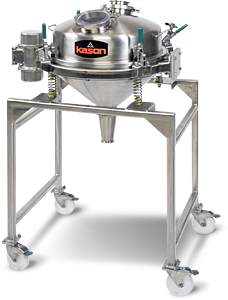 Kason's Ultra-Sanitary Batch Sifter features all-stainless construction with ground and polished welds, vertical quick-disconnect clamps, a gap-free screen frame and domed, crevice-free interior, meeting the most stringent pharmaceutical requirements. MILLBURN, NJ — A new FDA, USDA and cGMP compliant Pharmaceutical Batch Sifter from Kason Corporation meets the most stringent pharmaceutical sanitary requirements, including standards for injectable products, according to Henry Alamzad, president. The dust-tight pharmaceutical sifter has a stainless steel housing, motor and stand, tri-clover inlet and outlet flanges, vertical quick-disconnect clamps and continuously ground and polished welds. screen to fully extend to the interior walls of the frame, eliminating the gap between the screen ring and frame wall of conventional screeners where material would otherwise collect. The unit scalps oversize particles down to 38 microns (400 mesh) from dry bulk pharmaceutical powders or solids-laden slurries, and can be disassembled with no tools for rapid sanitizing. stainless steel that, if broken, can be captured by a downstream magnet.